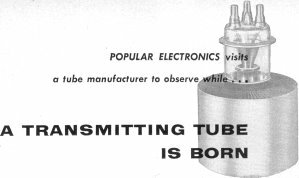 Usually when you think about vacuum tubes, you envision the short type that plugged into your parent's TV set or radio. 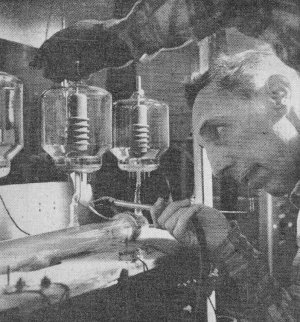 While they were sophisticated in their own way and also required careful assembly with a lot of manual operations, these high power tubes were in a class of their own. 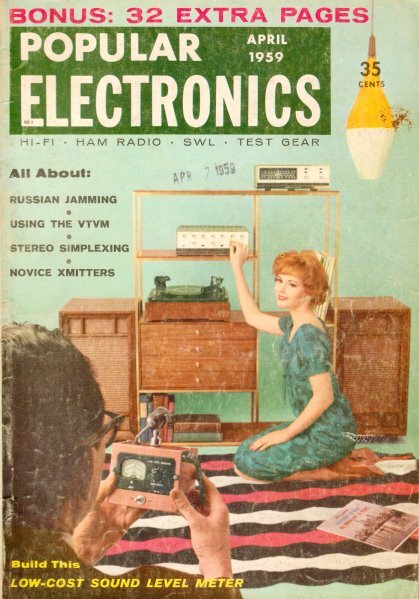 Even the one in this article from the April 1959 Popular Electronics is not as complicated as some of the ones designed and built for high power radar systems. 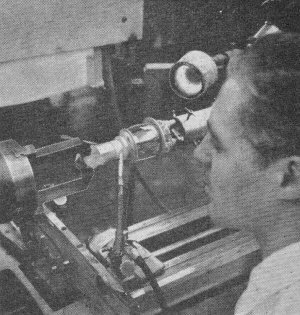 As always, it is interesting to note the lack of eye protection during assembly operations, especially given that the glass could easily shatter at any point. 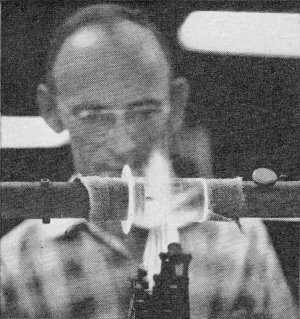 I'm guessing that the guy in Figure 1, doing the glass shaping operation over a hot flame, only has on glasses because he happens to need them to see (i.e., they're prescription). 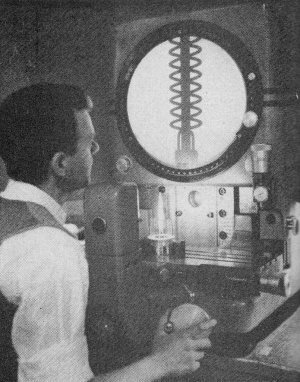 The manufacture of a high-power transmitting tube involves more than just assembling a number of metal and glass parts. In order to meet the demands of industry, the manufacturer must pay ever-increasing attention to reliability and long life. The manufacturing processes which most affect tube life are those relating to the precision with which the electrodes are manufactured and assembled, the extent to which all impurities and foreign particles have been eliminated, and the degree of vacuum obtained inside the tube. Recently POPULAR ELECTRONICS visited the Amperex Electronics Corporation plant in Hicksville, N. Y., to find out how a manufacturer of high-quality electron tubes handles the problem of building long life and reliability into a modern high-power, high-quality transmitting tube. 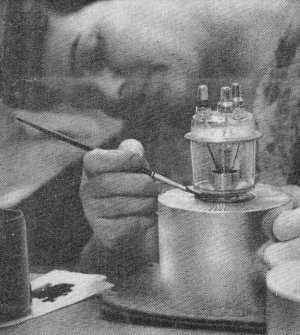 A typical transmitting tube, the 5924A, was followed through the different stages of its manufacture, and photographs of each of the key steps were taken. 1. 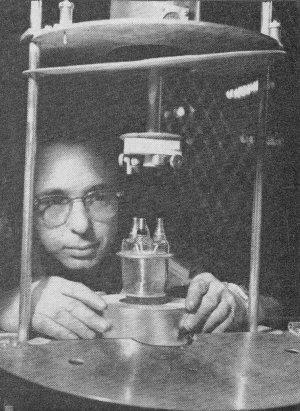 Glass technology is an important aspect of tube manufacturing. The glass is softened by jets of flame from a specially designed fixture. When the glass is soft enough, the operator shapes it with special glass-shaping tools. 2. Cleanliness is more than a byword to the tube manufacturer. Tube life and reliability are decreased when impurities, such as oxides, are deep within the metal elements. Here the electrodes are placed in a hydrogen atmosphere furnace to "reduce" oxides. 3. The cleaning process goes on. The most modern and efficient cleaning equipment is used by Amperex at various stages of tube manufacture. 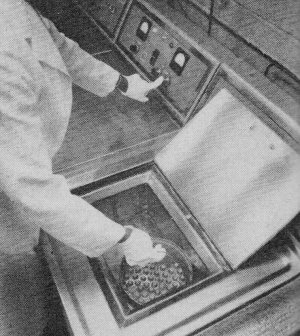 Here an ultrasonic cleaner eliminates the last vestiges of surface contamination which may exist on the tube's metal electrodes or glass parts. 4. The care exercised in fabricating and cleaning all the tube components naturally extends to the inspection procedures. Parts are projected many times their actual size on a screen so that even the slightest degree of misalignment is easily detectable. 5. Having insured the cleanliness and accuracy of all components of the tube, the assembly procedure begins. The first step is to assemble the delicate filament structure with hand tools. 6. The metal anode is now mounted. 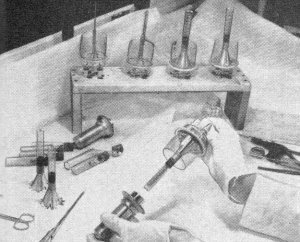 In background, note the different stages of assembly of the 5924A tube. The assembler always keeps the working area immaculately clean. 7. Anode is sealed to the grid and cathode mount. 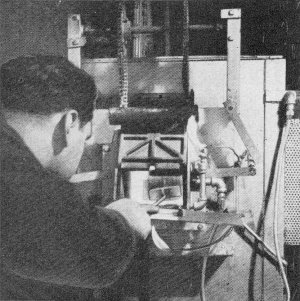 A highly skilled operator performs this exacting procedure on a lathe-like machine which was designed for this operation. 8. 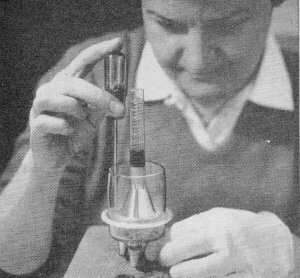 Creating the vacuum inside a tube involves more than just pumping out gas. It also includes removing gas trapped within the tube elements. To do this. the electrodes are heated until the impurities are driven off. 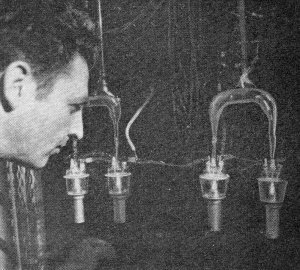 Here the gas is pumped out (through the horseshoe-shaped glass tubing) while the tube elements are heated. 9. After all gases and impurities are pumped out of the tube, it is necessary to make certain no other impurities enter. This is done by "sealing off" the opening through which the gas was evacuated. A 5868 tube is shown here. 10. Now for the finishing touches. With the same care exercised in the internal fabrication and assembly, all the external surfaces are carefully silver plated and, at the same time, specific areas are painted for purposes of identification of tube elements. 11. The final step is to "fire it up" and subject it to a thorough testing. All electrical characteristics are tested to insure that the tube will not only meet, but exceed, specified ratings.